GROUP OF EIGHT: 1939-45 Star; Pacific Star; Defence Medal 1939-45; War Medal 1939-45; Australia Service Medal 1939-45; Australian Service Medal 1945-1975, - clasp - Japan; Civilian Service Medal 1939-1945; Royal Naval Volunteer Reseve Long Service and Good Conduct Medal (GVIR Ind:Imp). R.F.Priest S9863 on first medal and sixth medals, S.9863. R.F.Priest on second to fourth medals, N49931 R.F.Priest on fifth medal, Robert Frederick Priest on seventh medal and S.V.820 E.R.A.4Cl. R.F.Priest RANVR on last medal. The first, sixth and seventh medals pantographed, the other medals impressed. ; also a duplicate set of the first five medals as above, some appear to be copies or later issues, and a RNVRLS&GC Medal but a EIIR issue, no ribbons (see below) and all medals named as above except the last which is engraved ERA IV R.F.Priest SV820; also a Pacific Star, without ribbon, impressed to NX131490 J.H.Lucas (appears to have a family connection to above). Two groups and a single, the first group swing mounted, contact marks, otherwise fine - very fine and an unusual grouping, the rest good very fine. 1. Case with miniature medal and ribands for Civilian Service Medal and with case slip cover marked Robert Frederick Priest; case and miniature medal with clasp and spare ribbon for Australian Service Medal 1945-1975 and with case slip cover marked RF.Priest S9863; medal delivery box with medal leaflet for WWII and after 1945, an Aug, 70 reprint; also soft vinyl and felt lined storage cover for first medal group. 2. Spare ribbons for the first set of eight medals, and a second lot of seven ribbons for the same set excluding the Civilian Service Medal, all ribbons new. 3. 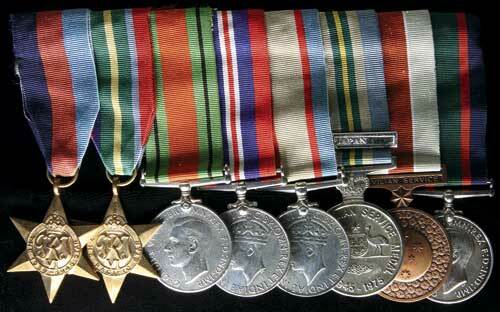 Ribbon mounting bars for 5 and 8 medals respectively, both include pins but these detached. 4. Dog tag for R.F.Priest, E.R.A., S9863, in fibre compound and attached to a thin neck chain, this broken. 5. Dog tag for 19803 B.W.Priest R.G.A., in aluminium (R.F.Priest's father). 6. Dog tags for NX151513 A.G.Priest, two in aluminium (R.F.Priest's brother). 7. WWI Rising Sun collar badge in oxidised bronze. 8. Returned from Active Service badge (WWII), N39858. 9. various enamel lapel badges, includes Royal Australian Navy Reserves (KC); M Navy & Allied War Services Assoc 1984; RA Arty (KC); T Group Assn 26th Inf Bde (KC); Haberfield Fivedock Abbotsford RSSILA 1939; RSL badges, three figure type (5); RSL Life Member badges, three figure type (2); Rats of Tobruk Bowlers badge; also tie bar inscribed 'Bob Priest'; RSL Five Dock tie bars (2); Extremely Disabled War Veterans Association Australia (QC), large and small and with receipt named to Robert Priest. 10. Ashfield R.S.L. Sub-Branch 60th Anniversary 1919-1979 medal in gilt (30mm) with suspension loop. 11. Pollokshaws Royal Arch Lodge No.153 medal in bronze (28mm), based in Glasgow, Scotland. Civilian Service Medal award to Robert Frederick Priest granted 13/4/1995. Robert Frederick Priest, boilermaker, born 15Apr1920 at Fivedock, Sydney, NSW; Enl.25Jan1937 in Army militia (N49931), as Gunner with 14 Field Brigade; mobilized with RANR 13Nov1944 at Sydney, passed trade test for A/ERA IV; various postings including HMAS Shropshire 23Apr1945-17Apr1946; with Shropshire supported landings at Brunei and part of the force at Balikpapan landings, returned to Philippines and then to Tokyo Bay for Japanese surrender ceremony before departing for Sydney in Nov1945; Disch.18Jul1947 as ERA IV ex HMAS Penguin. Father: Bert Walter Priest (19803 RGA), resident of Fivedock, Sydney, NSW. Brother: Arthur George Priest NX151543 (N54137), born 21Oct1921 at Fivedock, Sydney, NSW; Enl.26Feb1943 at Port Moresby, Papua; Disch.02Apr1946 as Private ex 4 Aust Amph Veh Incr (T/S). Family Connection: Joseph Harold Lucas NX131490 (N282615), born 02Mar1900 at Wellington, NSW; Enl.27Oct1942 at Pyrmont, locality on enlistment was Fivedock, Sydney, NSW; Disch.18Jan1946 as L/Corporal ex HQBBCAU.